It is an aphorism that “real estate is a people business.” This refers not only to the nature of transactions, but also that property gains its value via its ability to serve the demand of the population for appropriate places to live, to work, to shop, and to recreate. 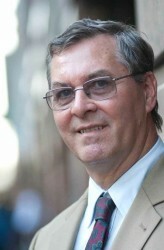 Demography is fundamental to the real estate industry. The map of population growth (2010 – 2016) nicely illustrates the demographic strength of the Western region. These eleven states added more than 4.6 million residents over that time span, accounting for 32% of the entire nation’s population growth. There is a powerful reason to expect that real estate capital will respond to the evidence of such expansion. That said, the West is the iconic region of the “wide open spaces,” or as the old cowboy song had it, “Give me land, lots of land…” Density is an issue for a majority of the region’s cities, and there is a real push/pull between the urban core and perimeters as a locus of growth. Nevertheless, this is a matter of sharing strong positive trends rather than coping with a shrinking pie. Employment statistics for the region’s metropolitan areas over the past year have been more than encouraging. Several of California’s metros are expanding significantly faster than the average 1.5% U.S. average in employment: San Jose leads the way with 3.3% gains; Sacramento (2.8%), San Francisco (2.5%), and San Diego (2.2%) follow. Although Los Angeles’ job gains measured a lower 1.7%, this was still enough to add 103,600 to its employment rolls. Elsewhere, Denver enjoyed 3.1% growth (43,400) and Reno surged with 4.1% (8,900 jobs). Boise, another smaller metro, posted 4.2% growth (12,500 jobs). 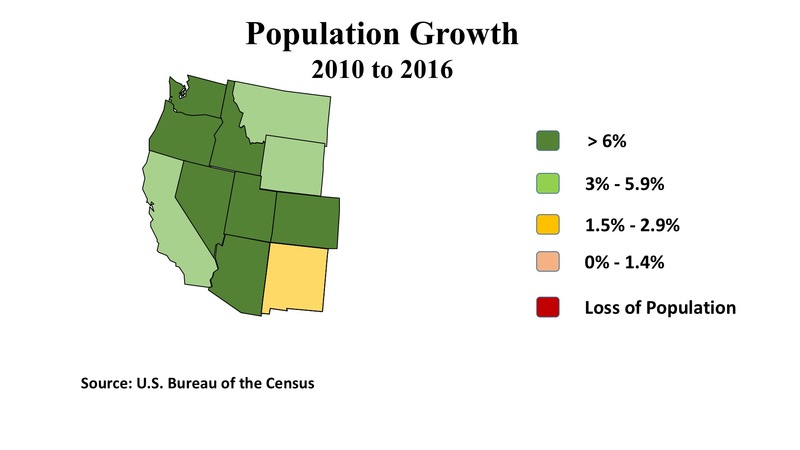 Utah’s economy is humming throughout the state: with 3.5% growth in Salt Lake City, in Provo, and in Ogden, and 4.5% in St. George in the southern part of the state. The Pacific Northwest states similarly display widespread strength, with gains of 3.1% in Washington and 2.9% in Oregon. Seattle (3.5%, 67,000 jobs) and Portland (2.6%, 29,500 jobs) are important drivers for the area, but smaller metros like Spokane in eastern Washington, as well as Salem and Bend in Oregon are posting growth rates exceeding even the impressive statewide numbers. 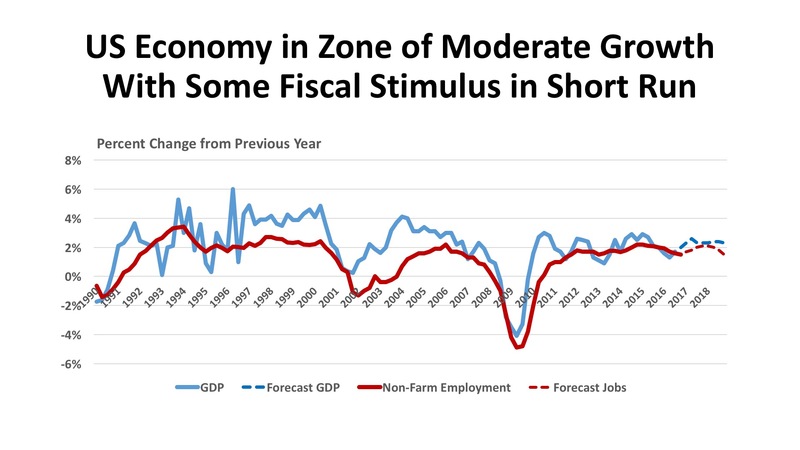 Fiscal stimulus at the national level should reinforce the economic expansion in the West. Investments in defense will play to the region’s strength in manufacturing materiel, including aircraft and missiles. Technology becomes a vital security tool in an era of cyberwarfare. Tax policies that can be expected to favor real estate should reinforce the trends toward population and job growth. Policy changes will, of course, not be an unmixed blessing but in the short run will tend to favor this region a bit more than in East or Central states. Transaction volume across the country pulled back approximately 15% in 2016, compared with the prior year. This was not necessarily a bad thing, as investment totals were approaching the pre-financial-crisis “bubble level” and there were legitimate concerns of unreasonable asset price inflations. This was especially true in the nation’s major gateway cities. While there are variations by region and by property type, the discussion which follows should be understood in the context of a market pulling back from an exuberant peak in 2015. For the West, the drop in property investment was 13.5%, slightly less than the nation as a whole, helped by a 6.8% increase in multifamily transactions to $42.6 billion. Office. 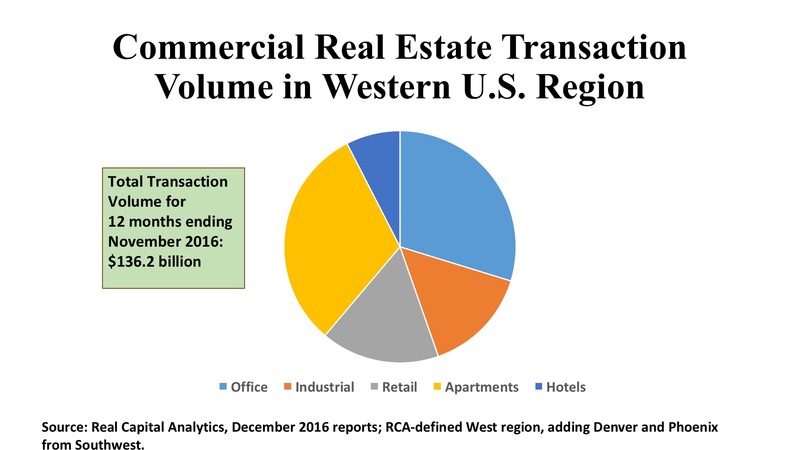 Investment in the West’s office markets was off 10.5%, to $40.5 billion, less than the declines in the East (12.3%) and Central (20.6%) regions. In large measure, the shift in volume reflects a marked preference for suburban assets during the past year. Two-thirds of the office capital flowed to suburban properties in the West, and such assets had prices per square foot ($317) that were just 73% of the price level of the region’s CBD assets. Moreover, the number of suburban deals (1,373) was more than eight times higher than those in the downtowns (165). Despite the higher share of investment, though, suburban cap rates at 6.2% were 110 basis points higher than downtown office properties. Many metros registered multibillion dollar transaction levels. Los Angeles led the region with $10.7 billion, and 89% of the activity was in its suburbs. San Francisco was a bit of an outlier, with 60% of its $6.2 billion in acquisitions in the CBD. Seattle’s $4.8 billion and Portland’s $1.1 billion were nicely balanced, with about the same shared between city and suburbs. But for San Jose ($3.4 billion), San Diego ($2.6 billion), Denver ($1.8 billion) and Phoenix ($1.7 billion) were heavily weighted toward suburban office properties. Industrial. This sector posted the steepest investment decline over the year, dropping 31.8% to $20.2 billion, a major shock given the huge industrial markets serving West Coast ports and the sprawling distribution facilities in California’s Inland Empire. Unusually, there were more flex space transactions (556) than warehouse deals (254), the higher prices per square foot for flex space ($173) versus warehouse ($106) should have buoyed the investment totals – but there were just not enough deals to push the investment aggregate up any further. Los Angeles approached the $4 billion mark in deal volume, about twice the level of second-place San Jose. Other markets with more than a billion in industrial sales were Phoenix, the East Bay, the Inland Empire, Orange County, San Diego, and Seattle. To put things perhaps in a more favorable light, it should be noted that this region surpassed the East ($17.3 billion) and Central ($12.1 billion) in industrial investment totals for the year. Retail. Like industrials, the shopping property sector plummeted in the West during 2016, with $22.5 billion representing a full 20% drop from the year before. Malls and smaller centers captured the bulk of retail investment, at $17 billion or three-quarters of total for this property type. Strikingly, the West trailed the East in retail investment by more than $5 billion, or 18.2%. This is not to say there aren’t some interesting stories to tell. For example, Las Vegas led all Western metros with $4.2 billion in retail real estate investment, eclipsing even the much larger L.A. market ($4.0 billion). Tertiary markets claimed $3 billion, in 290 individual retail property deals, reflecting the sprawling demography mentioned earlier. And five metros (Denver, Phoenix, East Bay, San Diego, and Seattle) each attracted more than a billion dollars apiece to the shopping sector. For 2017, it will be interesting to see how the region’s demographic and employment strength translates into investor interest for consumer-related real estate.